I’m pleased to have found this photo, one quick snapshot taken on a wander through the Leeman Road area on 16 April 2006, part of a much longer walk on a sunny Easter Sunday, one of my old ‘Wanderings’ pages. When I heard, a couple of years back, that the Junction pub was to be demolished, I wanted to get up there and get a photo or two, but there were other things going on at the time, more important to me. I didn’t remember then that I already had this image of the place from years back. Just the one, but it will do. And looking at it again ten years on almost to the day has led me to more thought and more reading/research/discoveries, as has been the case with many of these ‘April daily photos‘. Looking at the photo itself, it’s obvious that the pub isn’t exactly surrounded by a community of houses, and that it appears a bit stranded, in the middle of the industrial district of Leeman Road. Behind it are a couple of short streets of small terraced houses. Newer residential buildings are a little further along, but otherwise it’s just old industrial land, the edge of what we’re now calling ‘York Central’, where many demolitions have taken place. A place awaiting a new shape. So a pub here would struggle, you could say. The pub’s advertising sign on the verge draws attention to the function room. I wonder how many people went to a function at the Junction. I know that many people went to gigs here. I vaguely remember going to one myself, though I can’t remember who it was or when it was. But I’ve been told that sometime in recent years (2010-2012ish) the UK Subs and the Angelic Upstarts played here, the latter at a Punk All-Dayer type of event. Earlier than that, a pub review site mentions gigs here in 2005. Nostalgia is one thing. Nice to have a bit of reminiscing. But these days, increasingly, it’s less about that for me, more about the reasons things change, the reasons some places survive and others don’t, why some places are sustained and campaigned for, while others just get knocked down. Relevant to York and to everywhere else too. The Junction public house closed in February 2013 and was placed on the market in March 2013 by Barry Crux & Company. 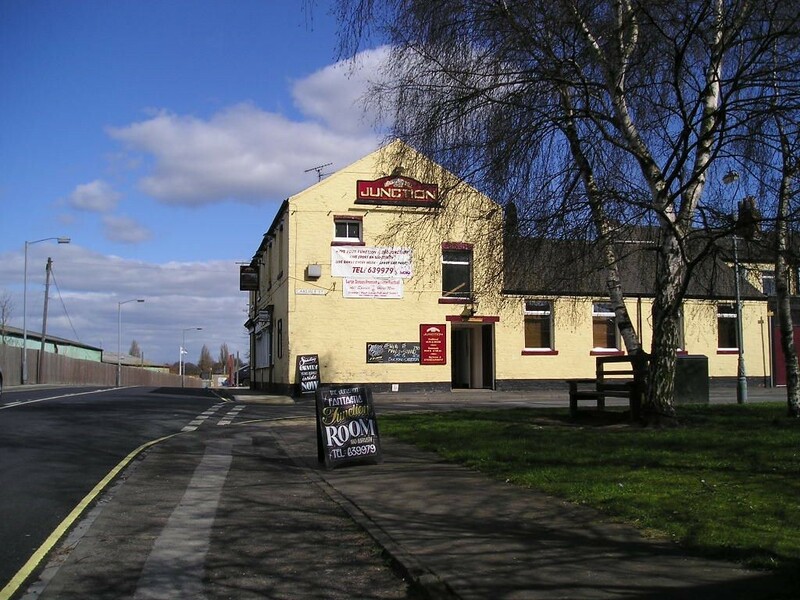 No interest arose in taking over the property as a public house and it was sold at auction in September 2013. It can be seen that the property was satisfactorily advertised to allow for it to be taken over and run as its public house. In addition it is considered that alternative community facilities of the same nature are present within easy walking distance either in The Leeman Road area or within the City Centre. It is therefore considered that the loss of the communal facility is acceptable. Incredibly quick turnaround on this one, with a planning application submitted and validated in mid November 2013, recommended for approval, and decided 27 Mar 2014. So there are now houses on the site where the pub used to be. They’ve been designed to blend in with the existing housing behind. So that’s good, isn’t it. Except … well, other things could be said, but perhaps too much for what was supposed to be a shortish page of readable length. It’s mainly about the value of land, isn’t it. You’re right, if you move v slowly on street view there are at least two versions of the pub visible and the site empty before the houses! This corner of York has to be one of the most changed since my childhood. It’s good isn’t it, and I remember similar in the images of the Hungate area, where the St John Central building appeared and disappeared as you moved along Stonebow. I imagine it’s changed since though, as the images from the Street View are updated. Have noticed though that Street View now includes an option to look at these older versions of their images of a place, which can be a useful tool, has helped me with some of the info on this site.